The social networking platform Instagram drives off-premise sales. 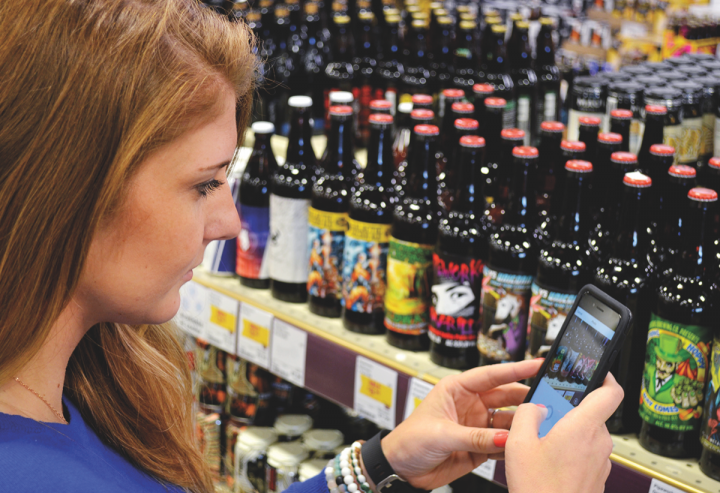 At Chicago-area retailer Binny's, communications coordinator Hilary Jurinak (pictured) uses Instagram to highlight the store's beer selection and promote events. Mendez Fuel, a Miami convenience store chain known for its craft beer selection, received two cases of Funky Buddha’s Wide Awake It’s Morning imperial maple bacon coffee porter at its Coral Gables location on a Tuesday. By 10 a.m. the following day, only two bottles of the coveted beer—priced at $18.99 a 22-ounce bottle—were left. According to general manager Andrew Mendez, a simple Instagram post was all it took to sell the beer. City Beer Store in San Francisco has also discovered the power of Instagram. “Being located in the Bay Area, we know that social media is how our customers communicate,” says co-owner Craig Wathen. “We were early adopters of Instagram.” The shop now has nearly 7,000 followers on the platform. Wathen says that, although it’s difficult to measure, Instagram has positively impacted his beer sales. “You see people coming in 30 minutes after a post, looking for a beer, with their phones in their hands,” he explains. Green’s Discount Beverages, which has six stores in Georgia and South Carolina, promotes its selection via Instagram as well. “It’s another communications tool,” notes beer director Adam Tolsma. “You have to have social media support to be relevant in craft beer today.” He adds that Green’s Ponce City Market location in Atlanta—which offers growler and Crowler pours—has particularly benefited from Instagram posts. Wathen and other retailers say that Instagram’s immediacy gives it a leg up over other social media sites, especially when it comes to new product arrivals. “We like to post something that’s a surprise,” Wathen notes. Indeed, the San Francisco shop has received such a strong response to product announcements via Instagram that it no longer uses email to alert customers about new arrivals. Binny’s, meanwhile, received 70 likes when notifying followers of the arrival of Founder’s KBS earlier this year. The chain doesn’t promote very limited releases via Instagram, instead focusing on the arrival of new local and seasonal brews. Instagram is also ideal for promoting in-store events. Binny’s, for example, will post a photo of an in-store beer and pizza tasting as it’s getting underway. And Green’s uses Instagram to promote “Rare Beer Tuesday” events at the Ponce store. Despite the lift Instagram can bring to a retailer’s beer sales, use of the platform also brings its difficulties. Wathen and Tolsma point to the time required to effectively use the platform. “It can take longer than you think if you want to do it right,” Wathen explains, noting that the use of accurate hashtags is vital. Tolsma cites fan interaction as a hurdle. “My biggest challenge is responding to questions in a timely fashion,” Tolsma says. And Mendez laments that his store’s success with Instagram has become a challenge in itself. “Since we’ve become one of the area leaders with Instagram, the pressure is on us to stay on top of the game and to be sure we’re getting all the right beers,” he notes. Retailers who have been successful promoting beer on Instagram say it’s important to use high-quality photos, respond quickly to followers’ questions and update posts frequently. Mendez recommends avoiding price references and ensuring that posts don’t appear to favor any particular brewer. Tolsma adds that patience is essential to building an Instagram presence. “It takes time to build followers and a critical mass,” he notes.